We have all seen them. The painful looking big toe that is twisted and misshapen, sticking out from a flip flop. 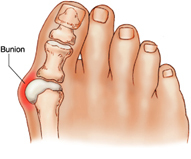 Bunions (or hallux valgus) are the most common problem affecting a person’s forefoot (front of the foot), and can significantly impact the quality of life for those suffering from the problem. Studies have shown that approximately 23-35% of people are affected by bunions and that those rates increase for individuals over the age of 60. A hallux valgus deformity typically includes a medial shift (moving towards the inside of the foot) of the first metatarsal joint and a lateral shift (moving towards the outside of the foot) of the big toe. There has been debate about whether footwear can cause the deformity, however the most common cause of the issue can be traced back to bad genes (yes, blame your parents) and results in biomechanical instability of the joint due to arthritic changes or laxity (looseness) of the ligaments around the joint. So, how can physical therapy help? There are a number of ways that physical therapy can aid in reducing some of the symptoms associated with painful bunions. First, your physical therapist will be able to provide information regarding footwear and modifications that can be made to footwear. Certain types of shoes (such as high heels) can make the pain worse by increasing the pressure on the painful joint. A large toe box, toe spacers, splints, and metatarsal pads are all options that can be used to help alleviate pain. Secondly, stretching the muscles in the back of the leg can help to decrease the amount of stress that is placed on the foot. Tightness in the back of the leg can lead to increased pressure on the ball of the foot and can make symptoms more severe. Finally, moving the joint (mobilization) can help to reduce some of the stiffness found in the joint and can be an effective way to reduce pain. Unfortunately, sometimes physical therapy is not enough to reduce pain levels and improve motion in the joint, and surgery cannot be avoided. Following a bunionectomy surgery, physical therapy is an essential part of your recovery to help restore motion to the foot and big toe, and will help improve your gait mechanics so that you can return to the activities that you love.